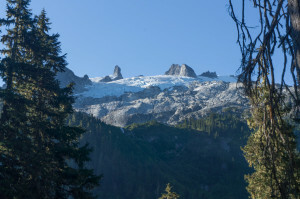 Ossa is the only “hiker’s peak” in the Tantalus Range north of Squamish. Though the range is less than ten miles from downtown Squamish, this is British Columbia, so it is still “remote” enough that most people get there by helicopter. 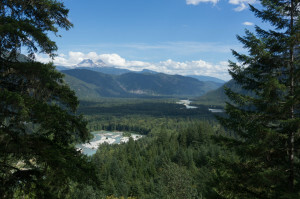 For the po’ folk, there are two other options: crossing the Squamish River to the center of the range on a cable used by the water utility, and hiking in to the north end of the range from the logging road on Ashlu Creek, which bridges the Squamish. 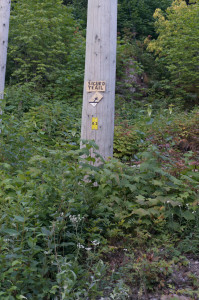 Starting at an inconspicuous sign on the Ashlu road about 200 feet above sea level, a relatively well-signed and -used trail leads to the base of a glacier at the head of Sigurd Creek around 4,000 feet. From here, the entire range can be reached with varying degrees of difficulty (and no helicopter). 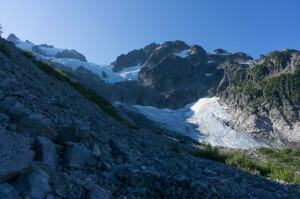 From camp at the “trailhead,” I started up the trail with ice axe and running-shoe crampons. I wasn’t sure what I could do, but hoped to traverse Ossa and Pelion, the two northernmost peaks, and possibly scout out the approach to Tantalus, the highest peak in the range. Slogging up from near sea level, I admired the steep sides of the Squamish valley below. Ancient glaciers carved the valleys all the way down to the ocean here, creating either steep-sided fjord-like inlets, or flat-bottomed river valleys where broad, braided rivers meander to the sea. After the initial climb along Sigurd Creek’s cascades, the valley flattens, and the trail crosses woods and slide paths, passing Sigurd Mountain and Lake to the north. This section is fortunately in good shape, with minimal bush-whacking required in the slide path. The local mountaineering club had even installed an improved log to cross Sigurd Creek, though in this dry year it could probably be forded or even jumped. After more climbing, the trail emerges on the terminal moraine of a receding glacier below the Ossa-Pelion ridge. 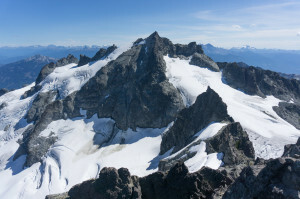 From this point, a faintly-flagged route continues to Ossa’s easy northwest ridge; climbers of Pelion and other Tantalus peaks should continue cross-country up the left-hand moraine and ridge. I had hoped to climb Pelion first, then loop over Ossa on the way back, but I didn’t know what I was doing, and the peaks are not obvious from below, so I followed the flagged route, eventually realizing that I was headed to Ossa. 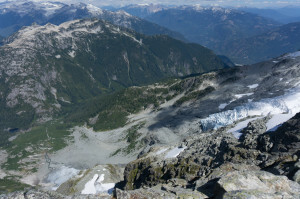 I made my way south and southwest, following bits of trail through grass and krummholz, then taking the path of least resistance up talus and slabs, skirting below a glacier until I found myself on Ossa’s northwest ridge. Unlike seemingly every other ridge in the Tantalus Range, this one is broad and gentle, with easy walking mixed with class 2 steps. As I gained elevation, I began to see the rest of the range, including Pelion, and finally realized what I had done. While I had hoped to ascend Pelion first, I figured I could always do my loop in the opposite direction. Looking behind me, I was impressed by huge, high Sigurd Lake, and minor, unnamed icefields on peaks to the north and west. Nearing the summit, I found the only difficulty on the route, a short 4th class notch with steep gullies dropping to glaciers far below on either side. Rather than taking the easy way around, I opted for the direct approach on the way up, doing a short pitch of 5.0 to reach the summit plateau. I found a register containing various scraps of paper, including a print-out of a route description, but unfortunately no information on whether the traverse from Pelion would go. With plenty of day left, I sat down in the sun to eat and think. 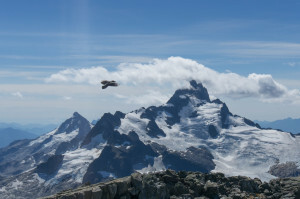 A raven, possibly used to being fed by summiters, played in the updrafts around the peak. He obligingly kept it up for 5-10 minutes while I shot away with my camera, trying to capture both him and Tantalus to the south. To the east and west, the Squamish and Clowhom Rivers made their lazy way to the sea, just above its level. To the south loomed Tantalus and its various glaciers. Examining the ridge toward Pelion, I decided that it looked unlikely to be doable, with an apparent sharp notch and spire between Ossa and the saddle. Pelion’s west ridge also looked unappealingly steep head-on, though seeing it in profile on the return, I realized that it probably would have been doable. Not wanting to mire myself in an epic, I retraced my steps. Lower down on the trail, I passed one backpacker who had tried to climb Ossa and run out of energy, and several day-hikers, possibly visiting Sigurd Peak or the falls. Tantalus itself should be day-hikeable by this approach, but not this season.